Written by Studio1337 on December 14, 2010. 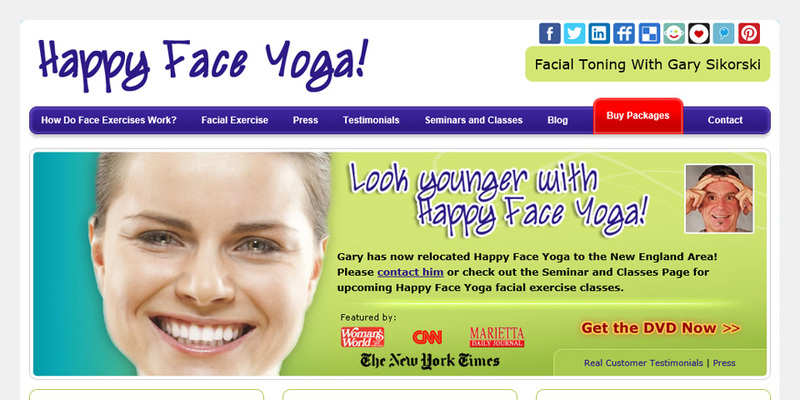 This afternoon, we launched the latest version of HappyFaceYoga.com. Gary Sikorski is an expert practitioner in facial exercise; apparently he has quite a widespread reputation! He sells an exercise program aimed at helping people look younger without expensive cosmetics or surgery. It makes sense – if you want any part of your body to look younger, tone up the muscles, right? So Gary has this great product, and he had a very sad site, the type of site that can only be produced by a cheap sitemaker product (yes, he was using one of those), a site that had no chance of improving in search engines and made his otherwise very professional product look cheap and unappealing. We aimed to change that, and I think things came out quite nicely! You can’t see the old site anymore, so you’ll have to take our word on how bad it was. But you can see the the new site right here – HappyFaceYoga.com. Enjoy!